My opinion on local businesses. I'm the kind of person who can't stand shopping at a grocery store that I'm not familiar with. I like knowing where to find everything I need without wasting my time backtracking and going in circles all over the store. I guess I just have a guy's mentality when it comes to shopping and I like to get the job done fast. If speed grocery shopping were an Olympic event, I'm pretty sure I'd have some medals. A couple years ago, the Albertson's supermarkets in the area were bought out. Most of them were converted to Fresh Market stores, but a few were purchased by Ridley's. I was not excited when this change took place, since I don't like changes and I thought the new store had a strange name, but I have to admit that since that time, Ridley's has impressed me and earned my business over the years. After the buyout, I was surprised to see most of the original employees still working there. I was told they offered continued employment to the existing staff, which I thought was impressive for a buyout. What impresses me the most about Ridley's is that their prices are very competitive. With food prices having increased everywhere over the last year, I still feel I can get more food for the money at Ridley's. I occasionally shop at Coscto and Maceys for certain items, but Ridley's is still my store of choice. They have a good selection, but I don't ever feel like I'm shopping in a crowded warehouse store environment. I've gotten to the point that I'd rather donate a kidney than drive through a busy Walmart parking lot again. 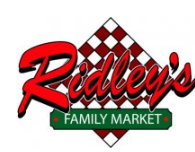 Ridley's offers a clean store, bakery, pharmacy, deli, friendly employees, and low prices. They also have a customer loyalty rewards program where you can cash in the points you earn by shopping for gift cards to local restaurants and businesses. As a resident of Utah County for over 40 years, I've been served by many businesses in the area. I am creating this blog to acknowledge businesses, business owners, and employees who I have been impressed with.